India: A country of 1.3 billion is also the land of beauty, money, and opportunities. While the country is still counted in the list of fastest developing nations, its economy tells a different story altogether. Being counted in the not so rich countries India’s begging Industry makes more revenue than companies like Flipkart. While the country has its own set of economic, political, cultural issues to deal with, one that had remained the biggest issue has been poverty and begging in India. Beggars begging on traffic signals or near plush public places is one of the most common sights to witness in India. While it is difficult to avoid the Indian beggars what is even more challenging is to put a stop once and for all to this forever going activity. Over the last 2 decades, the economic growth of India has resulted in an uneven distribution of weather where the rich have gotten richer and poor have gotten poorer. But what may come to you as a surprise is that with the new India emerging have also emerged new beggars that are professionally trained and yes are making more money than you can even imagine! What many of us may be unaware of is that Begging is India is a crime under the Indian Penal Code yet we are far from putting an end to it. The offense of begging comes under the prevention of begging act. This legal act may be called differently in various states but two of the largest markets of Mumbai and Delhi have adopted it and decided to call it the same. Where in Delhi “The Delhi Prevention of Begging Act” applies on the other hand in Mumbai “The Bombay Prevention Begging Act 1959” is applicable which deals with the penalty or detention of beggars for the offense of begging in India. 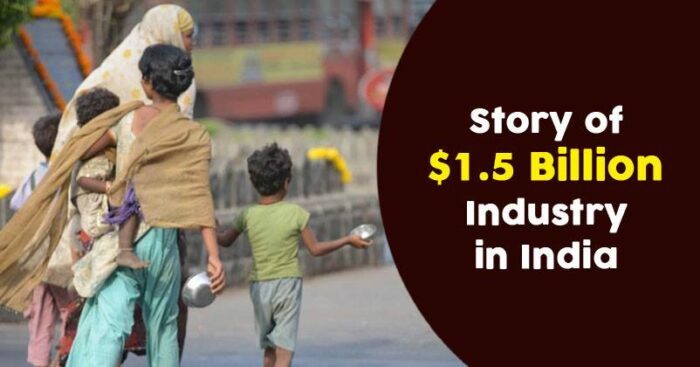 The supply chain of the begging industry in India is even better than that of behemoths like Unilever where live humans can be transported in the shortest possible time with absolutely no pilferage. We are all familiar with the different business models of different industries but that of begging industry in India is very complex which involved more than one illegal activities like human trafficking, terrorism, and other heinous crimes. Yes! India is a country of people with mixed economical statuses which also includes many who live under the poverty live but begging in India is a business that runs on the streets smoothy and efficiently generating money. Like the many other industries, Begging in India follows a very organized structure where there are gangs in every city which are managed by the gang leaders who report to city leaders who report to the state leader who then reports to their owners who are drug lords/ beefing mafia/ begging cartels. As per the last census data India has over 4,00,000 beggars with 81,000 only being in West Bengal. The statistics also reveal that there were 2.2 lakh male beggars and 1,91 female beggars in the country. Uttar Pradesh was second on the list with 65,835 beggars followed by Andhra Pradesh with 29,723 and Madhya Pradesh with 28,695. The capital of the country Delhi recorded to have 2,187 beggars but according to other reports, this number goes as high as 60,000 and 80,000 in Mumbai. There’s always good and there’s always bad and the same as in the case of Indian beggars where some help the law enforcement agencies to maintain peace there are some who are always ready to create havoc. If the statistics are to be believed an average beggar gets up to 24,000 INR per month. If we were to compute the total revenue generated out of these 4,00,000 beggars it becomes $400 x 0.3 Million beggars x 12 months= $960 million + Accruals of 24% (2% per month) due to payday loans = $1.25 billion or even higher. That beats the revenue for some of the biggest companies in the world including Flipkart! As the activity runs on hard cash it is for obvious reasons difficult to manage it. Depositing in the bank is an invalid option as it attracts tax liability and questions from the IT departments. So this cash is put to use in intensive businesses like real estate, scarp and others to generate returns out of them! With the major focus of funding terrorist activity, the superior motive of the activity remains to make more and more money. It won’t be new to know that global terrorism has 3 major sources of revenues- begging, abduction of children and selling them to Begging Mafia. Everyone loves money and everyone loves to spend it and in this case, beggars in India are not so different than us. So what do they really spend their money on? It’s majorly on drugs, alcohol, tobacco or sometimes investments. So next time you want to give away that Rs.10 from your pocket to the beggar on the street remember there are other ways of charity like food and clothes. What many of us miss is that giving away any amount big or small is not going them anyways but rather destroy something good. In that one moment of pity, you might just be funding a bombing into your neighbor country or another 9/11 attack in your own. Well, India is a country full of surprises and what may leave you surprised or not so surprised its that rich beggars in India make more than you at your day job. There also have been instances when the rich beggars of India have been caught red-handed with mobile phones, investing in FDs or Insurance premiums. We all have a lifestyle that we follow or wish to follow but did you know about the lifestyle of the rich beggars in India? Well, be ready to be jaw-dropped because the richest beggar in India is worth more than you! Bharat Jain, the richest beggar in India has 2 flats whose approximate value is 70 lacs each and a juice shop on rent which pays him an additional 10K per month but still operates at a signal in the Parel Area of Mumbai. There are many more such instances of rich beggars in India like a lady who was paying 36,000 as annual insurance premium. One thought that is common to strike looking at the child beggars begging in India is that they are worth so much more! They are worth of education, good life, and even a better future! One of the most reported crimes of India remains the abduction of children. Children are abducted by anti-social/ terrorist groups and sold to the begging mafia in India who are taken far away from their home locations and then taught, tortured, drugged and made to beg. Child trafficking in India is a huge menace. While the most trafficked children are sold off to the begging mafias in the country, some female children are sold off in the dark world of prostitution. In comparison with the aged or young beggars, child beggars are more likely to receive alms. Maimed children are twice more likely to receive alms as compared to a fit child beggar. This remains the sole reason why children who are abducted are maimed and thrown on the signals to beg. According to the Indian National Human rights Commission, up to 40,000 children are abducted in India every year and are forced by Drug Cartels to beg on the streets, of which 11,000 remain untraced. You may or may not have missed noticing that most often the women begging on the signals carry babies who are mostly sleeping. Ever wondered why? Well, the little babies are not sleeping but are drugged to an extent that leaves them to lose their consciousness until the next working hours of that lady beggar. To conclude we can say there obviously is a connection between the system and these gangs who are not only exploiting the emotions of the commoners to get money out of their pockets but also absolutely innocent people who deserve a better life.